Alexander Hristov was born on July 28, 1964, in Plovdiv. He spent his childhood in the town of Troyan, where he played football for the local team of Chavdar. He moved back to Plovdiv as an 8th grader and it was in 1980 when he first stepped on the boxing ring. Although considered quite a late start, only 3 years later his winning period with Locomotive Boxing Club began follwed by world rink. In 1993, at the World Amateur Boxing Championship in Tampere, Finland, he won over the Cuban champion Joel Casamayor (Bantamweight – 54 kg). Alexander Hristov is a boxing legend. 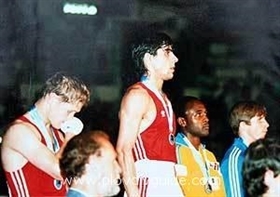 He is a two-time European and World Champion, Boxing World Cup winner, Seoul Olympics silver medalist. From 380 boxing matches in his career he has only lost 15. He is the only high-rank BG boxer who has never had his nose broken. At the Seoul Olympics he was with a serious tumor in his biceps, and sxtill managed to become the silver medalist! In the period 1988-1990, Alexander is with a serious injury and diagnosed with left hand muscle tumors. After being operated, he starts training again and is soon back on the boxing rink. In the 1990s he palyed 5 seasons in Germany. After the 1996 Atlanta Olympics he leaves the BG national boxing team and becomes a coach in Germany. Although a very popular sportsman in Germany, Alexander is still very popular in his native Plovdiv. His idol has always been Mohamed Ali.